As data centers demand faster and faster storage, Micron is answering the call with long-lasting, solid-state drives that offer up to 800GB of capacity. 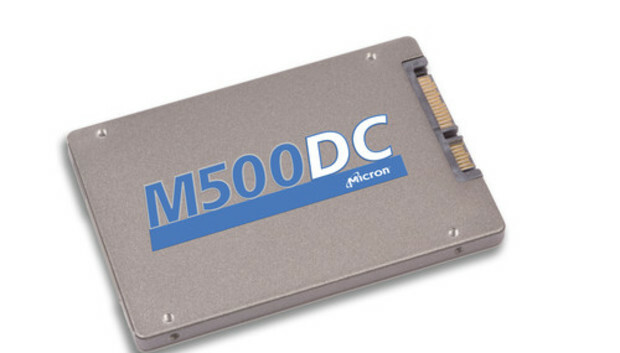 Micron's M500DC SATA SSDs are priced at US$1 per gigabyte and come in capacities of 120GB, 240GB, 480GB and 800GB. The SSDs will come in standard drive sizes of 1.8 inches (5 millimeters) and 2.5 inches (7 mm) and can be plugged into multiple bays. Servers are increasingly using SSDs, which are essentially power-efficient and faster versions of hard drives. Meanwhile, hard drives are moving to the back end of data centers for more long-term storage. SSDs are now being widely used as temporary storage and cache for faster processing of applications like databases and analytics. But companies also want SSDs that can last a long time in data centers. Micron claims its drives can achieve two "drive fills per day for five years," while also providing performance and power efficiency. The SSDs provide random read performance of 63,000 to 65,000 IOPS (input/output operations per second) and write performance of 23,000 to 35,000 IOPS, according to Micron's benchmarks. The sequential read performance clocks in at 425MBps (megabytes per second) and write fluctuates from 200MBps to 375MBps, depending on the drive. The sequential performance gets better as the drive's capacity increases. The drives are for slots based on the SATA storage protocol. These drives will not be based on the emerging NVMe (non-volatile memory express) protocol, which is faster and involves plugging SSDs into faster PCI-Express slots. The first data-center SSDs based on NVMe started coming out last year, and Samsung's 1.6-terabyte (TB) NVMe SSD is now being used in Dell's PowerEdge R920 server. NVMe is on the road map for Micron, and the M500DC SSDs are geared toward different customers, a Micron spokeswoman said in an email. The new SATA SSDs provide performance, enterprise features and endurance at a competitive price, the spokeswoman said. The new drives are MLC (multilevel cell) SSDs, in which multiple bits are stored in cells. The drives are available through Micron's distribution partners.